Transforming Organizations by Empowering Individuals. learn about what A-Plan can do for your team. 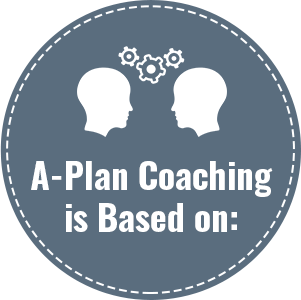 A-Plan is an optimized and scalable version of coaching, amplified by a unique and highly effective coaching method, a smartphone app, content curation, and tracking key metrics. With weekly video sessions, our purpose is to help clients create life-altering, lasting results in all areas of interest, personally and professionally. We coach the whole person because we know that thriving, fulfilled employees create successful organizations. Identify short and long term goals in all areas of life and work. Brainstrom a MAP(Multiple Action Plans) of innovative ways to reach those goals. Commit to new behaviors and habits for improved effectiveness and fulfillment. We offer clients a time efficient, easy to use, simple coaching method that increases overall fulfillment, productivity, happiness, and general wellbeing. Our method and technology platform support employees and teams of organizations with a structure that fosters innovation, achievement, engagement, and improved performance. What is a plan coaching? Copyright 2018 A-plan coaching. All rights reserved.